The rendered site plan from the Permitting submission can be viewed here. layout, critical adjacency, special education spaces, arts/sciences, etc. The MSBA was very impressed with the Clyde Brown Elementary School Educational Program document that they have requested the Town's permission to use it as a model example of a great program on their website for other districts to see. A copy of the detailed Educational Program can be viewed at this link. Over the fall of 2016 to winter 2017 the design team completed the Schematic Design plans for the new Clyde Brown Elementary School. 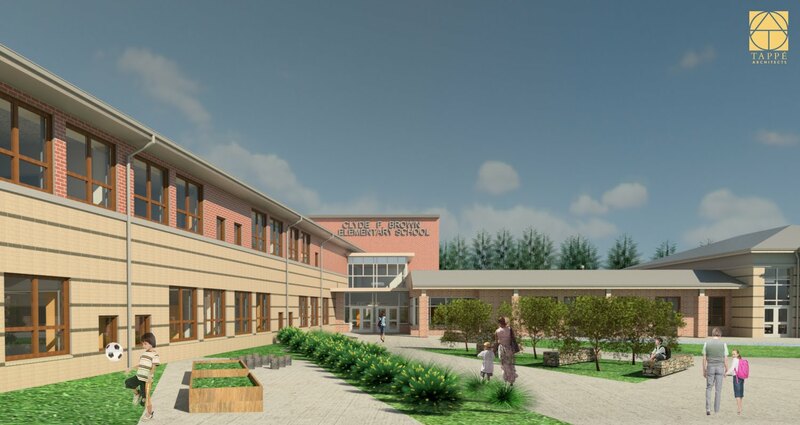 The resulting Schematic Design was the culmination of numerous meetings with the School Staff, the Building Committee, the community and representatives from many Town Boards and Committees. The Elementary School Building Committee and the School Department have reviewed, commented and approved the Schematic Design. The next steps with the Town in March and April is a series of informational presentations to the community to present and explain the design and total budget for the project. The next step with the MSBA was to submit the Schematic Design package on March 22nd for their staff and Board review and approval. The floor plans from the approved Schematic Design can be viewed here and the site plan can be viewed here. Over the Summer of 2016 the Elementary School Building Committee and Community voiced their support for Option 1B.2 as the preferred option (see image above). This option was submitted to the Mass. School Building Authority in August and approved by their Board on September 28th. The project has now entered the Schematic Design phase of the project. The design team will host various user group meetings with all school departments and various Town staff to collect feedback on the project to develop the design for Millis. The Floor plans from the approved preferred option can be viewed here and the site plan can be viewed here. The project completed the Feasibility Study phase in August. The building committee evaluated the existing Clyde F. Brown Elementary School facility and design options for the School's expansion or replacement. During the Fall and Winter months the Designer developed and evaluated a dozen site options with the Elementary School Building Committee (ESBC) and the Owner's Project Manager. The twelve (12) options were a high level "test fit" options to determine the feasibility of renovating the existing school or the adequacy of different locations for a potential replacement school. The dozen test fit options include a Renovation, Renovation with Addition and Replacement scenario's. Click the 12 options to view the site plans or download the PDF file at the bottom of this webpage. The ESBC narrowed the 12 test fit options down to 4 options for further study. The short listed four options are the renovation option 1A.1, the renovation with addition option 1A.2, new construction option 1B.2 and new construction option 1C.3. Refined design plans for these four options were presented at the Community Forum on April 13th for resident input. Those options can be viewed by clicking the option name above or by downloading the pdf's at the bottom of this webpage. 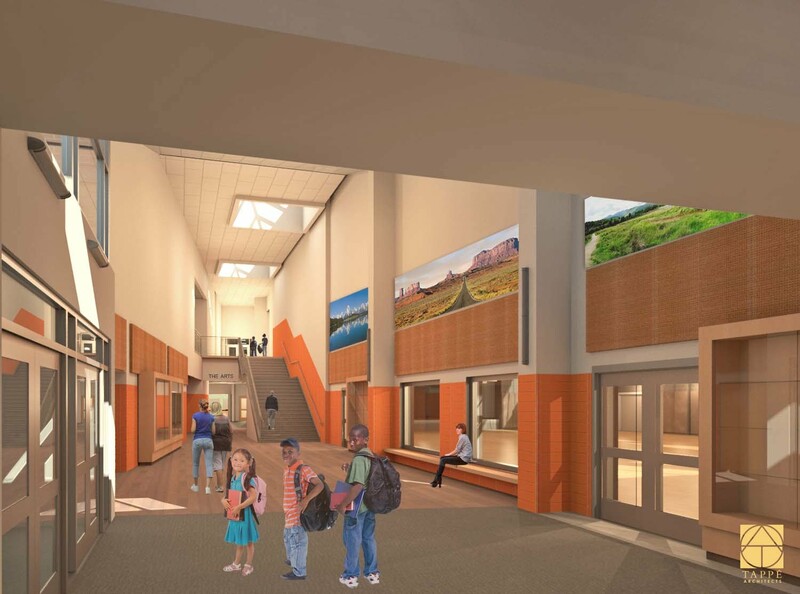 Design Team selection was completed with the Massachusetts School Building Authority. Tappe Architects, Inc. was chosen as the project designer. Click Here for a 3 minute video intro to Tappe Architects and what to expect from the start of the Feasibility Study.